As a rule, database objects depend upon other database objects. For example, views and stored procedures depend upon the existence of tables that contain the data returned by the view or procedure. The Objects Dependencies tree, introduced in dbForge Studio for SQL Server, offers a fast a simple way to view and navigate trough database object dependencies, that belong to each database object. Let's see how this feature is represented in the program. Once you connected to a database, you can view all database objects in the Database Explorer window. By default, the Database Explorer window opens when you start dbForge Studio for SQL Server. To open the window manually, in the View menu, click Database Explorer. Alternatively, you can press: CTRL+W, L.
Now let's expand Tables and try to analyze dependencies for a certain table. In our database we expanded the elements, belonging to the HumanResoureces.Empoee table. As you can see, in addition to columns, keys, triggers and constraints there are two elements ? Depends On and Used By. The Depends On element shows database objects that must be present for the object to function properly. In our case, the HumanResoureces.Emploee table depends on the Person.Person table and on the Flag schema. The Used By element shows the database objects, that depend upon the selected object. So, in our case, we can see, that the data from our table is used in a number of other tables, views, triggers, stored procedures and functions. In its turn, you can expand any object within Used By or Depends On to analyze its own dependencies. 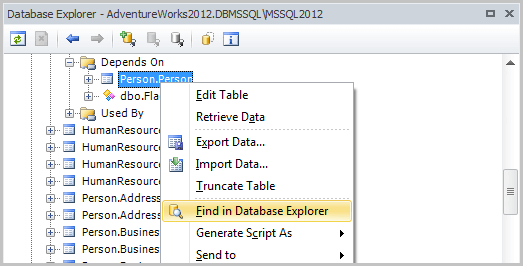 Also, you can right-click any database element to learn more about it, find it in the Database Explorer etc. (the list of available options depends on an object's type). The Object Dependencies tree feature enables to determine dependencies between database objects in a wink, what is meant to simplify and optimize your work with databases and their objects. The similar functionality is included into Microsoft SQL Server Management Studio, however it can show only basic dependencies. In its turn, dbFroge Studio of SQL Server provides more extended dependencies coverage, including DDL triggers, all objects from Security, Storage, Service Broker and much more.